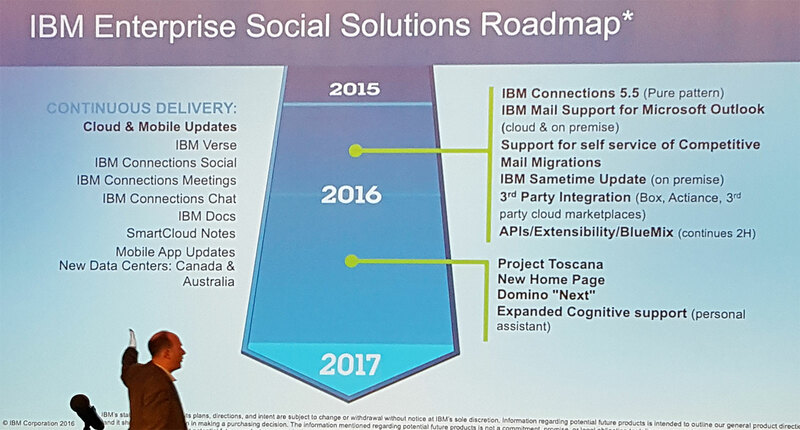 There has been radio silence on this blog since right before IBM Connect in the end of February. I intended to write a recap of IBM Connect after I got back from the conference, but I have just been very busy. I haven’t even had time to post the code from my presentation, but it will be up here shortly. 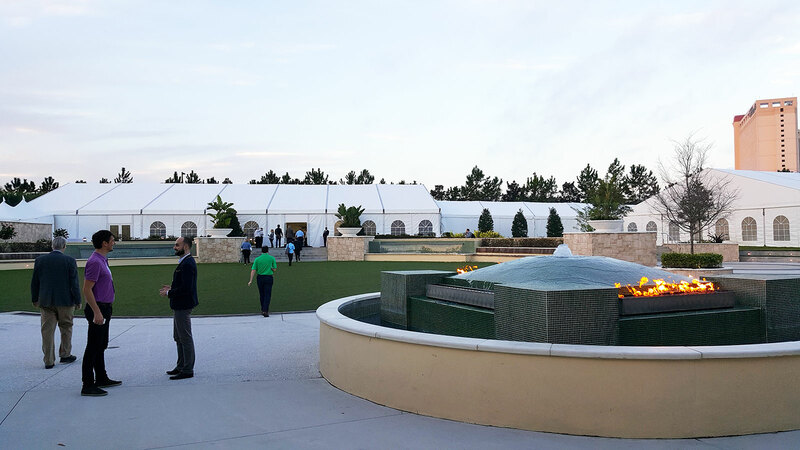 There has already been several good overviews of IBM Connect, but I want to share how I experienced it, and how the first conference away from Orlando was. It was both good and bad. The bad part was just some minor things. Like everyone else I found San Francisco expensive, with a lot of homeless people. The venue also lacked some of the natural meeting spots we had in Orlando, when many of us were staying at the same hotel where the conference took place. The restrooms at the Moscone Center could also use a makeover. But none of these were things IBM really could do much about. What they could have done better would have been to server a warm breakfast and lunch, at least a couple of days. The food in Orlando was great, and at last years conference it was even outstanding, in my opinion. So the breakfasts of cereal and pastries and sandwiches for lunch was a bit of a disappointment. The conference itself was good. 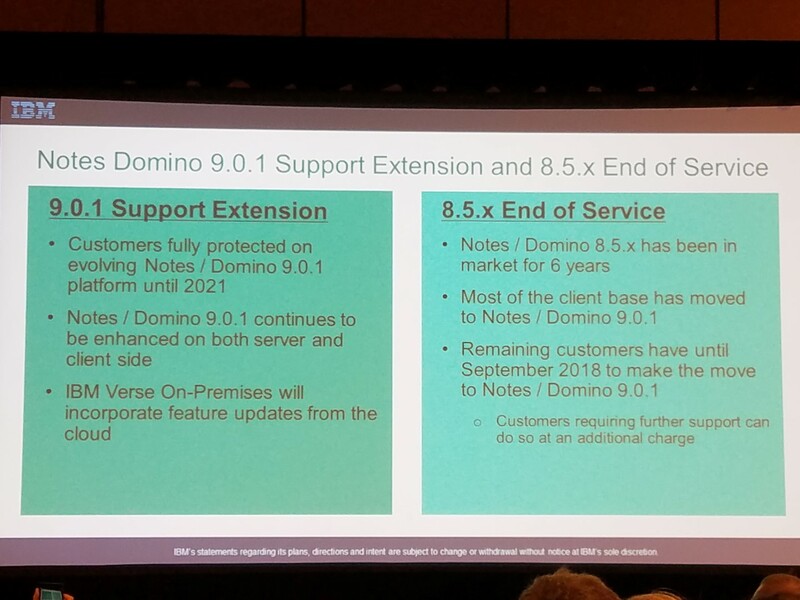 I enjoyed most of the sessions I attended, I learned about future enhancements to the Notes and Domino platform and ecosystem and I got to talk to a lot of people. I also met many of my friends in the community, but there however many faces missing. 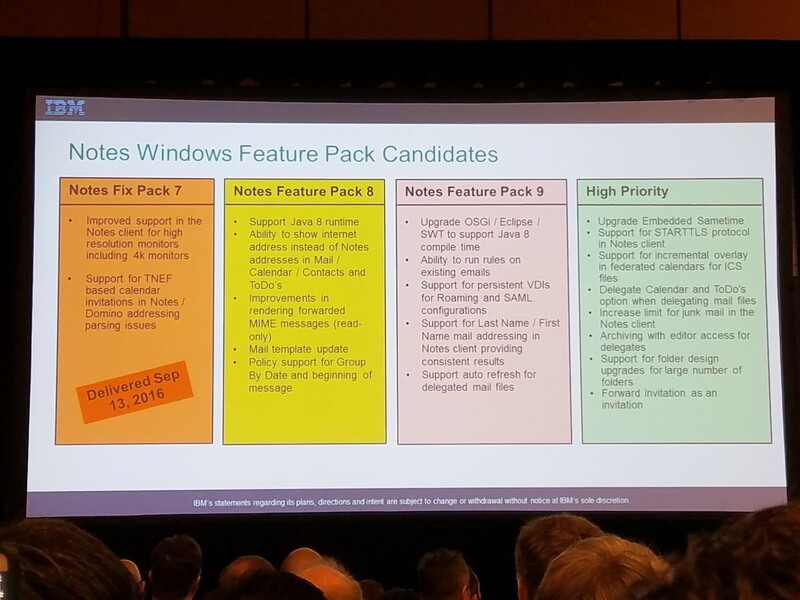 For the last few years more and more of the long-time Lotusphere/Connect attendees have moved away from the ICS platform into other technologies. It is just a natural progression. We all learn new things, try new technologies and broaden our horizons. IBM will build the next generation of Connections (codename: Pink) on Docker, using Nginx as the web server. 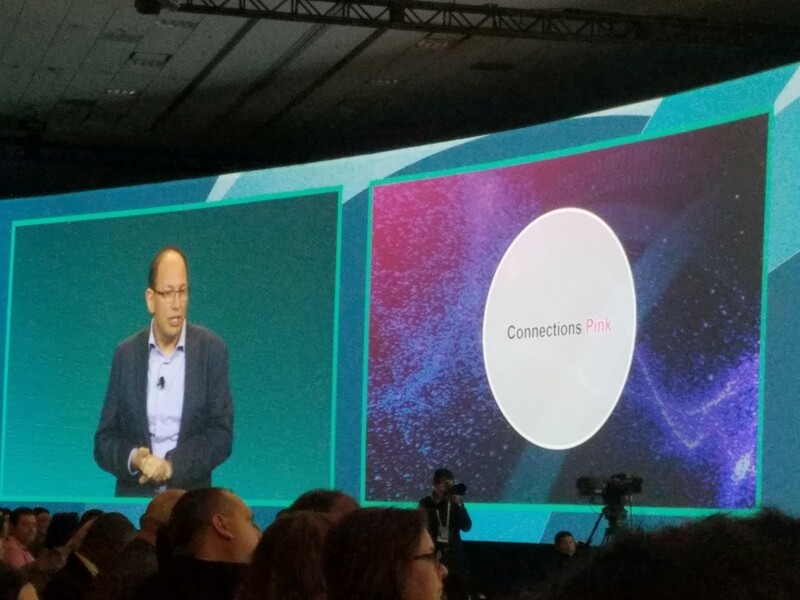 Connections Pink is described by IBM as a vision, not a release. From what I understand IBM will be replacing (and most probably extending) the current functionality in steps. This approach makes total sense to me. If you want to read more about Connections Pink, read Gab Davis’ excellent post. One of my biggest take-aways from Connect is how IBM is heading more and more towards component-ized solutions. BlueMix is just one example of this, where you can build your solutions by picking from a large number of different technologies, all on one host. IBM’s use of Docker is another example. I see this as being the future: integrate a number of standards based technologies into your solution, running them virtualized on any platform or in the cloud, and then deploy your solution to the users or customers without you having to install half a dozen or more different servers. What about the future of IBM Connect? Next year IBM will bring together a number of events into one flagship event called IBM Think 2018. 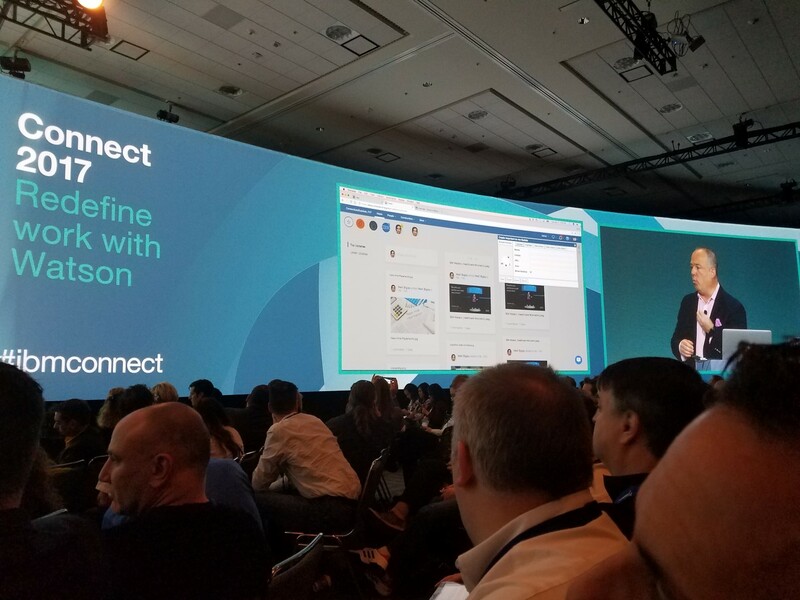 This conference will take place in Las Vegas March 19-22 next year, and will include Connect, InterConnect, World of Watson, Amplify, Vision and PartnerWorld. So San Francisco seems to have been a one-time venue. I think this a good choice by IBM. We all need to expand and break out of our comfort zone. Several of my friends from the ICS community attended InterConnect in Las Vegas a few weeks ago, and hearing them talk about all the exciting new technologies they learned about makes me really want to go. Lotusphere (and later Connect) had a good run for 25 years, but it is time to move on. There are so many exciting technologies out there, and why not learn what exists outside our own bubble, echo chamber or comfort zone? Personally I can’t wait for March 2018! IBM Connect coming up – Save $$$ on the conference fee! IBM Connect 2017 starts in exactly one month, and the early bird special ends tomorrow. But I can still save you some money. Reach out to me or any other IBM Champion, and we can give you a special promotion code to use during the registration to save you $100 off the conference fee. If you use the code before the early bird rate expires tomorrow evening (Jan 20) you get $300 off! So contact me (or any other Champion) and we can will give you the code. You can get hold of me on Twitter as @texasswede and of course through email texasswede@gmail.com. If you haven’t registered yet, it is time to do that. The block of rooms at the special conference rate will only be available a few more days. Nearby hotels are also filling up it seems, but you can still score some good deals. 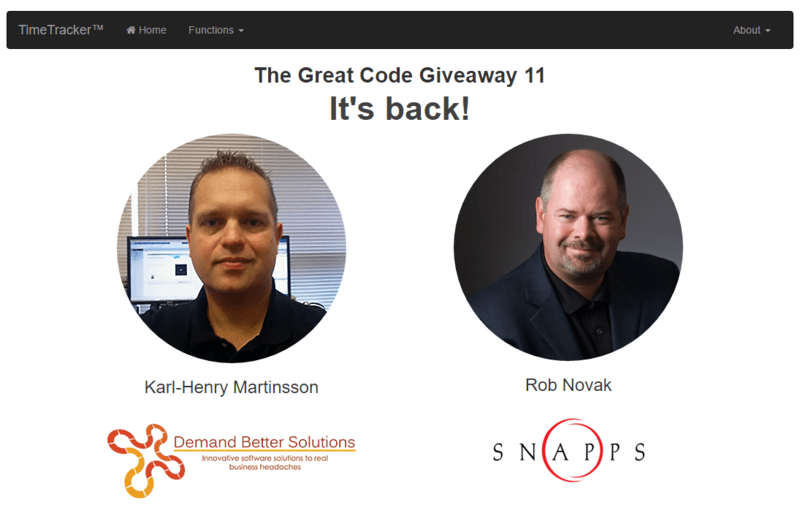 If you go to Connect, don’t miss me co-presenting The Great Code Givaway 11: It’s Back! with my fellow IBM Champion and friend Rob Novak. Our session is currently scheduled for Wednesday February 22 at 2pm in Moscone West, Level 2, Room 2006. I hope to see you in San Francisco in a month! IBM Connect 2017 – It’s that time of the year! 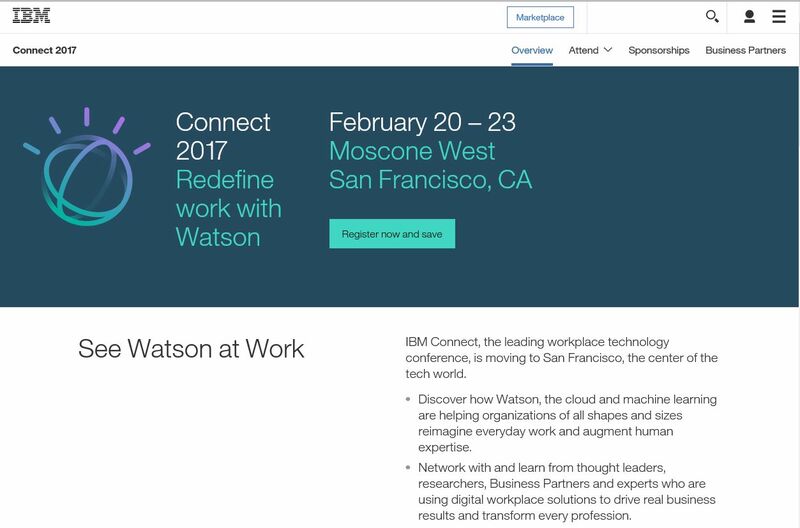 Registration for IBM Connect 2017 is open. The conference, in the past known and beloved as Lotusphere, has changed some. It takes place a month later than normaland has moved from Orlando where it did take place for the last 20+ years. The new location is the Moscone Center in San Francisco and the dates are February 20-23, 2017. Another change to the format is that the conference start Monday evening instead of Sunday. Otherwise the agenda looks very similar to what we got used to in the past. The list of session has not been published yet, the final selection of speakers will be made later this month. But I don’t doubt there will be plenty of great sessions woth attending. I hope to be able to go, this is a great conference not only for learning but also for networking and socializing with other professionals who work with the IBM Collaborative and Watson products. I hope to see you in San Francisco in February! 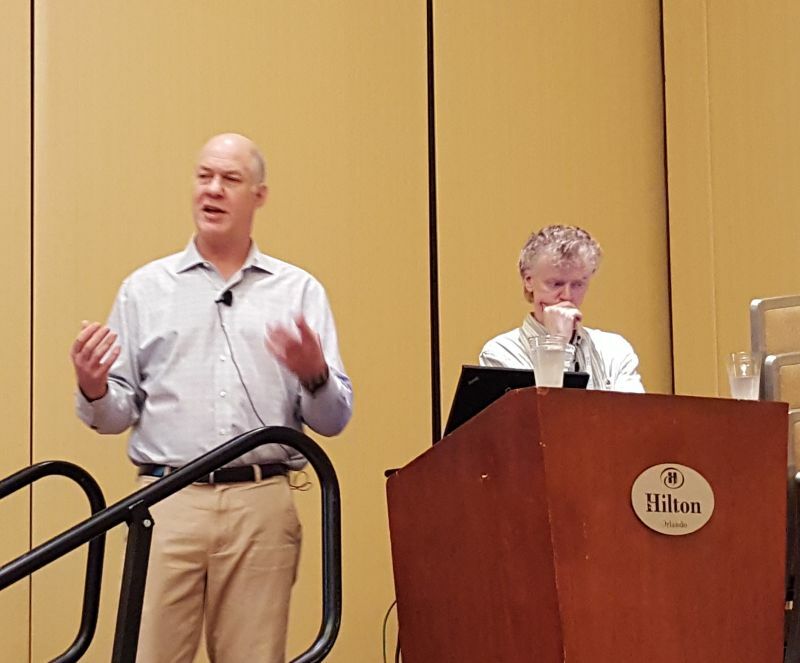 When I attended IBM Connect 2015, I thought it would be the last time I got to attend the conference that for most of it’s running was called Lotusphere. I attended Lotusphere 1997 in Nice but from January 1998 I attended the conference at Walt Disney World Dolphin and Swan in Orlando every single year. After the 2015 conference the contract between IBM and Walt Disney World was up, and everyone expected the 20 year run to be over. But something happened. 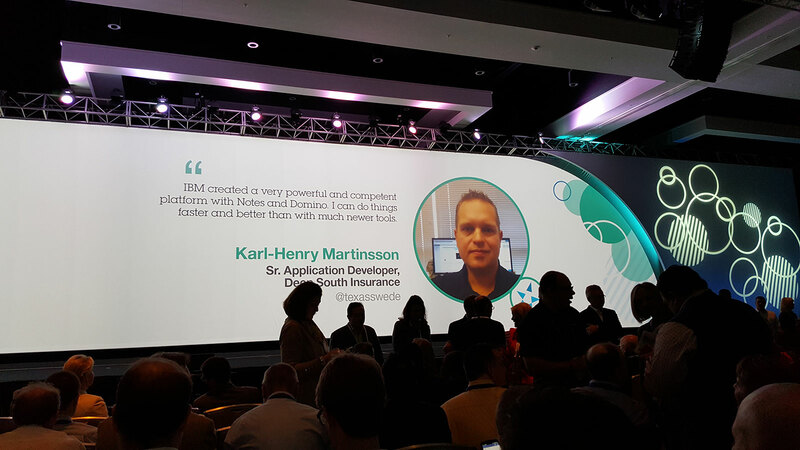 IBM decided to do another IBM Connect in 2016, this time at a new location in Orlando, the Hilton. And people came. I have heard a number of about 2,200 attendees. Yes, just a fraction of what it was at it’s pinnacle, with 10,000+ attendees. But still more than previous years. The hotel and conference area was great. You still had to walk between conference rooms like in the Swolphin but you did at least not have to run over to another hotel. The dining tents reminded me of the first 10+ years of Lotusphere, but the food was a notch or two above when we were used to at Swolphin. And it was great to be able to sit outside and eat if I wanted to. The conference was great. There is always room for improvements, but in general the conference team had done a great job. The scheduling was better than in many years, I was able to attend a number of great sessions and I even liked the new simpler badges. The check-in process was automated, and I used a combination of the conference app and the printed conference paper to find my session. I actually liked that, even if I did miss the convenient little agenda booklet one kept in the badge holder. I also did my first presentation at IBM Connect this year, a 20 minute Lightning Talk in the Expo Showcase Theatre. This was a bit of a challenge, as I had all the exhibitors right there, and the noise from everybody talking to the vendors made the presentation more difficult, both for the presenters and the audience. I hope that everyone that attended (thank you!) got something out of it. 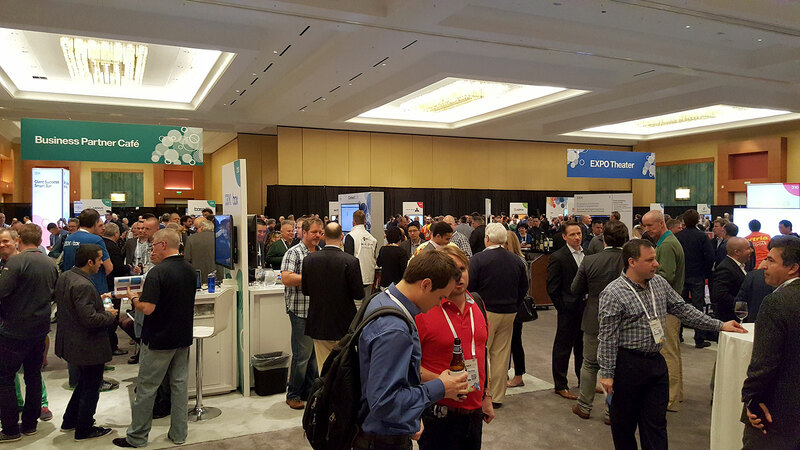 The IBM Champions were represented strong at Connect 2016, and we got a lot of exposure. Champions were featured on the screen before the opening session and also in many other places during the conference. Many sessions were also presented or co-presented by IBM Champions. When it came to the sessions, I noticed a theme. For the last 4-5 years we have seen a massive number of sessions geared towards XPages. 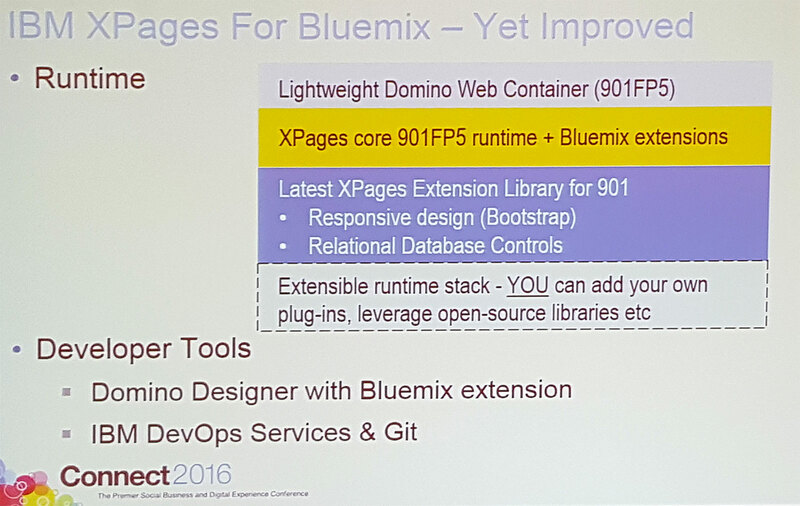 This year the big theme was Bluemix and integration between different services, including XPages. This is where the broad portfoilio of IBM really is beneficial, you can connect different systems with each other. Using Bluemix you can connect XPages to a SQL database or a Domino NoSQL-databas, you can throw in Angular.js or even cool new technologies like Node-Red and then use services from Watson to process your data. 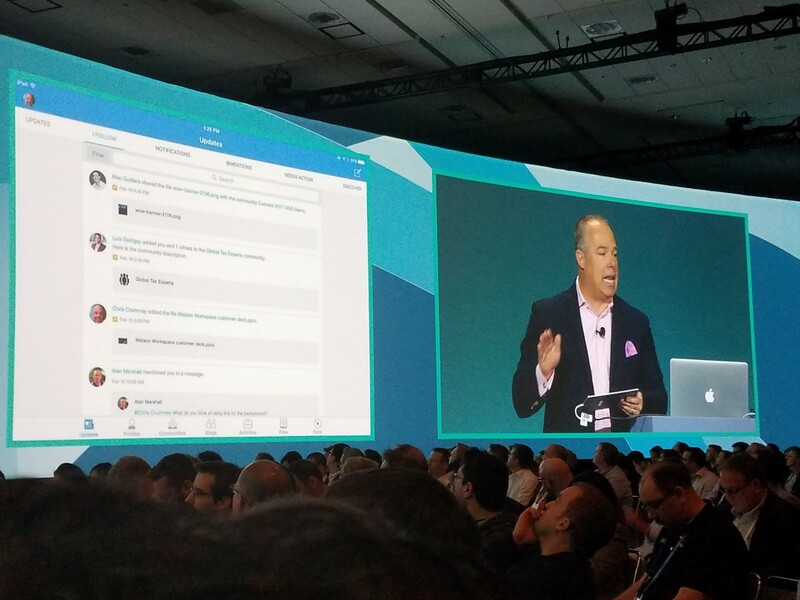 A year ago I felt a bit “meh” when it came to Bluemix, but after Connect 2016 I really want to sit down and start playing around with it and see what cool stuff I can do. The Opening General Session (OGS) was split into two separate parts. It was not until after the 45 minute break we got to see demos and learn more about future plans from IBM. But there were no customer panels and the customer presentations were short, to the point and relevant. I actually really liked this format. Good job, IBM! Lets talk a little about the vendor showcase. In 2014 the exhibit hall in Dolphin was way too big, and in 2015 it was moved to a very small and cramped room in Swan. This year IBM got it right. I was able to visit most of the vendors, and there was plenty of space to mingle with people as well as during the coffee breaks that took place in the Expo Showcase. So what are my suggestions for IBM Connect 2017, if IBM decides to do it again? Stay at Hilton, it was a very good location. Move the Lightning Talks to some place where it is less noisy and distracting. Update the badge holders with a pocket for business cards and perhaps even bring back the pocket agenda. Bring back the longer 2 hour jumpstart/master classes on Sunday. Otherwise I am very satisfied with how Connect 2016 turned out!